Thanks to a good friend in the St. Pete Astronomy Club, I was offered the opportunity to purchase a Cave 1959 10" f/7.1 off of facebook marketplace of all places for $200. I jumped at the chance because I currently have a 16" f/4.5 truss dob I made back in 2006, but of course it doesn't track. 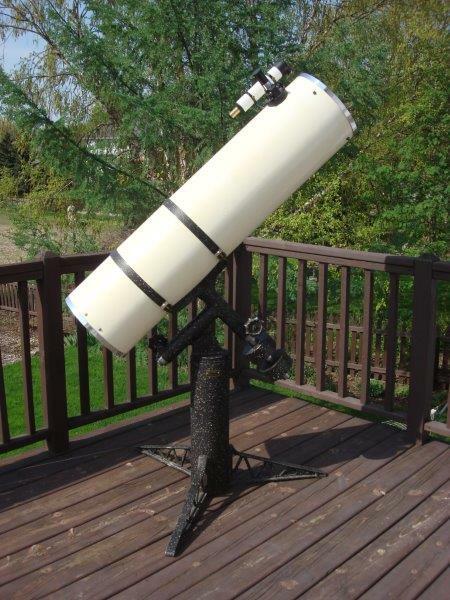 I built a 12.5" f/6 in 1996 that had a Nova Optical mirror with QSP coatings. I loved that scope and there are times I miss the sharpness of an f/6, so an f/7.1 instantly was appealing. Prior to the 12.5" I had a 10" f/4.5 Meade dob and a 6" f/6 Starfinder EQ. There was a time during college I worked at a local museum in the planetarium where we also did telescope observing on Friday and Saturday nights, and I really enjoyed their 12.5" f/6 Meade research grade EQ. All of these scopes had aspects I really liked, so having a scope that tracks and has a long focal length were all things I was hoping to enjoy again. I quickly found this forum and the Cave website, and started looking through many threads to ascertain the model and how to even start a restoration. I think I'm pretty handy, as I made two scopes, but metal work is something I'm not entirely comfortable or knowledgeable about. So I will be doing a lot of reading and relying on your expert advice through this process if you're willing to help. I will attach a bunch of pictures, but I did a basic mirror cleaning and inspection. There seems to be minimal rust and the both the primary and secondary will need to be recoated (not a shock). I read enough to know that this mirror has the potential to be a planet buster. I don't know if the motor works, as the cord has been cut. The previous owner got the scope from, I believe, the original owner. The fact that he still has the manual and eyepieces is amazing to me. I'd like to restore this properly so I'm not going to rush it. All advice is most welcome. Update: I'm trying to upload all the photos I took with my phone, but they are all over the limit. Edited by Guy Earle, 20 November 2018 - 11:40 PM. Congrats! Great scope. Looking forward to the restoration thread. Lots of good folks here who can give you any advice you may need. Great deal Guy! That's a real planetary beast! Keep us posted with pics, please. That was the first big scope I got to look through when I kid. I was eleven at the time (1973) and I thought that telescope was enormous as I had to climb a ladder to look in the eyepiece. 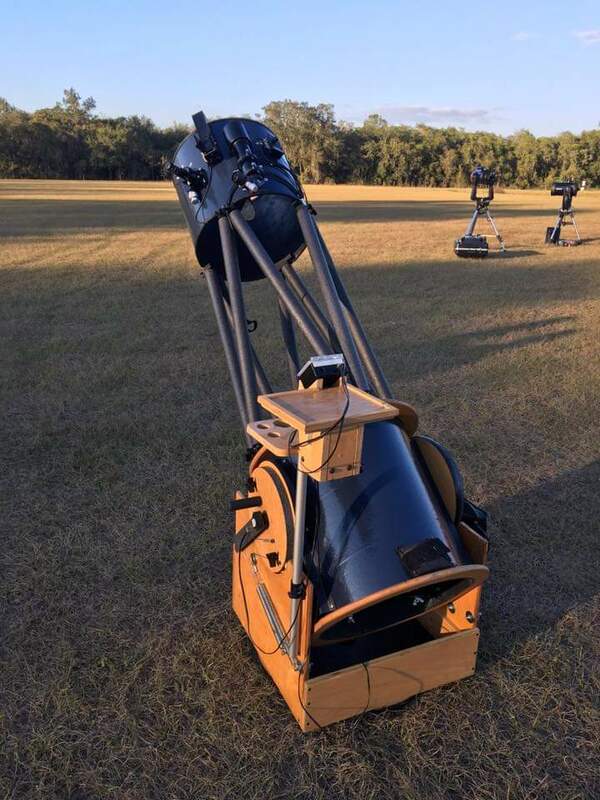 If you hover your mouse over the "Restorations" tab of "The Cave Mirror Registry" webpage http://www.cave-astr...stry/index.html , you will get a dropdown menu of various Cave Telescope restoration stories, sources for parts, etc. Very nice, a '59 Cave is one of the early ones! There should be a serial number etched in the mirror, sometimes hard to see without the light reflecting just right. I used to have an f/5 '59 Cave that was shipped to me in pieces and saved from a dumpster. Thank you for the responses, everyone. I finally resized some photos for you all to examine. The mirror was made in Feb '59 and this is the first time I've seen clear Pyrex, as all my other mirrors have been opaque. I'm going to have both the primary and secondary recoated. Recommendations? I guess my first steps will be to sand and paint the mount, and make sure the motor works. Like I said, metalworking of any kind is foreign to me, so I'll be reading as many threads as I can the next week to get an early handle on how to tackle this. Also, here are the eyepieces, which I believe are also the original ones described in the ad. You can clearly see that for some reason the power cord was cut. I can see from the ad from Sky & Tel back in May '59 that this is the Astrola Model "C," but how can one tell if this is the Standard or De Luxe version? Edited by Guy Earle, 21 November 2018 - 10:57 AM. I'm going to have both the primary and secondary recoated. Recommendations? 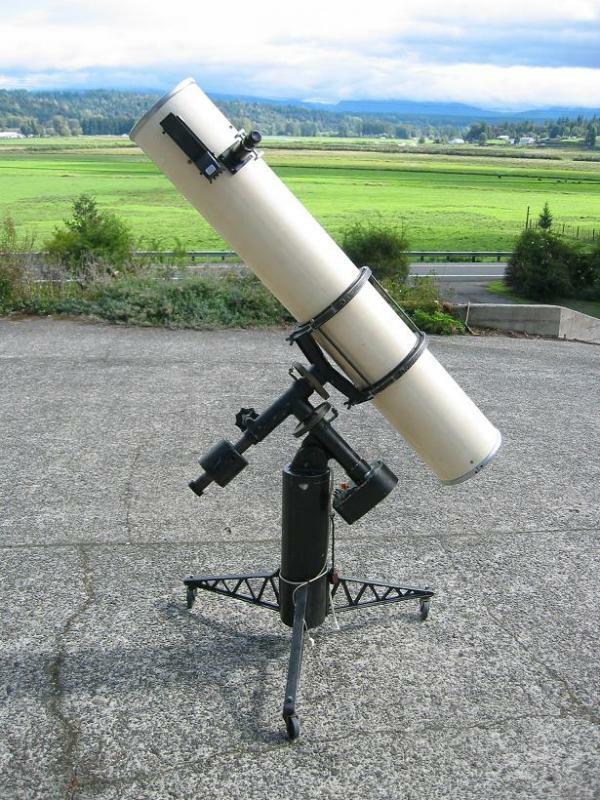 Here is a 1963 8" f/6 Astrola Deluxe with much of the look of your '59 scope. It appears to have the same brown Zolatone paint. Think hard before you sand down the paint because once you start you must commit to doing the entire scope to have it match. 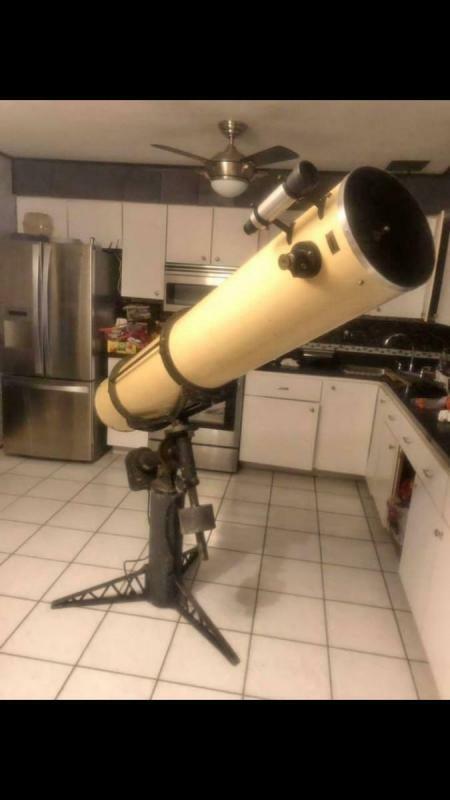 I was lucky that the paint on my scope was in good condition except for the pier and legs which I repainted in my own version of splatter paint and came close to the original color but not exact. I had my mirror realuminized by Terry Ostahowski in Anza, California. He tested the mirror and confirmed thatp it was slightly under-corrected. He refigured the mirror (for $75) and recoated it along with the old secondary, both 96% reflectivity. He also hand-selected a new secondary 1/20th wave. All this for less than $300. Terry was a pleasure to deal with and I highly recommend him. I can post other pics if you like. Just say the word. Congratulations and good luck with your new project. Edited by KentTolley, 21 November 2018 - 11:17 AM. Nice one. I still remember the first time I had a look at Saturn through a 10" pristine Cave. My jaw dropped. So sharp and clear. I have a unique 10" F7 Cave 1958. There was some sort of revamping going on at Cave in 58. This jives with your paper "First Printing 1958". Mine is a prototype used to define the production parts, quite cool in construction. It is on an observatory type pier. OTA looks identical to yours so far, maybe except for the end rings. My end rings are the rounded outside edge, yours look like they might be flat bands. I don't know when the change took place but I've seen the rounded type before. Unfortunately the OTA is currently back in the original factory sarcophagus, in the upper section of the barn. Think hard before you sand down the paint because once you start you must commit to doing the entire scope to have it match. I was lucky that the paint on my scope was in good condition except for the pier and legs which I repainted in my own version of splatter paint and came close to the original color but not exact. I had my mirror realuminized by Terry Ostahowski. Thanks for the info (and everyone else too). What black did you use on the mount? It has a nice satin finish. My scope has the original speckled paint, which looks like it got partially sand blasted, so I'm not a fan of it. 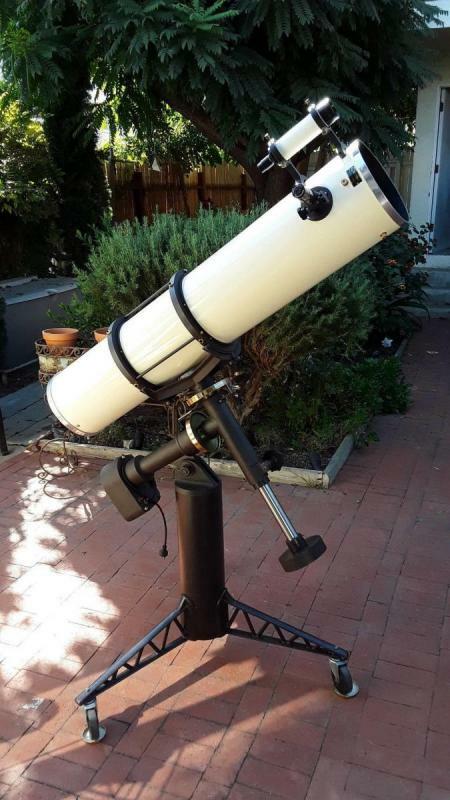 I wasn't originally thinking of leaving-repainting the tube white (all my scopes have had a blue/blue-gray look; I've attached a pic of my 16"), but I'm now rethinking that plan. I've never worked with fiberglass before, just sonotubes. Edited by Guy Earle, 21 November 2018 - 06:03 PM. Look up Al Paslow 1958 Cave telescope also. His is alson a 10" f/7 with the big spot speckled paint. He left the paint and rust alone. He left the patina intact and for his scope it turned out beautiful. Google him. Yours was made when Alika Herring was the master optician. He wasn't the only Cave optician at the time. Since you are going to get the optics recoated, why not have them tested as well if it doesn't cost that much more? Edited by KentTolley, 21 November 2018 - 06:39 PM. Only reason i never jumped was i just bought 4 scopes all at the same time. Just got a Cave 10" F/6 with a Cervit mirror and just don't have anymore room or $'s. 2 scopes gotta go. Make that 5 scopes. I don't even know what i got.. But for $200 it was the best deal i ever saw on a Cave. Edited by CHASLX200, 21 November 2018 - 07:05 PM. Parks fiberglass tubes clean up well with a wax/cleaner. Auto parts store or boat supplies. Edited by KentTolley, 21 November 2018 - 07:48 PM. I never could get any of my Parks tube to come out clean. All had yellowed with age. 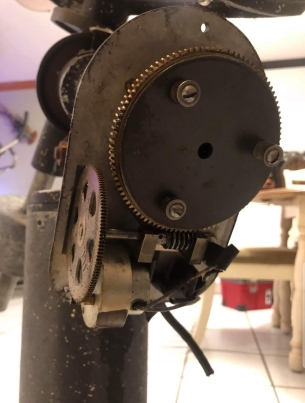 Hard to tell from the pics but I think your mount is the deluxe mount of that time with seal-master ball bearings in the polar housing but without the needle bearings in the declination housing. They would come along somewhere between '63 and Jan '65. 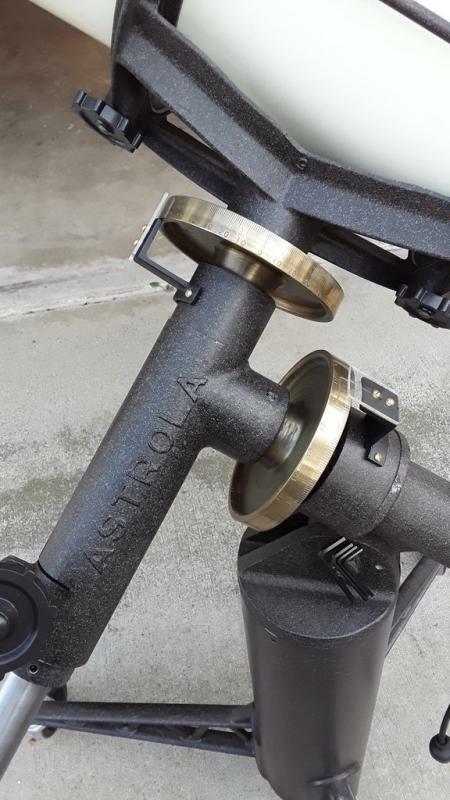 The "standard" mount is actually the Telescopics mount with no bearings in either housing like Al Paslow's scope. Edited by KentTolley, 21 November 2018 - 08:07 PM. Edited by clamchip, 22 November 2018 - 10:43 AM. This is my '59 with original paint. The mount I really only cleaned and touched up. The tube I used a marine fiberglass wax on - several times. Edited by sgorton99, 21 November 2018 - 09:39 PM. Enthusiastically agree...Majestic did a great job on my Cave primary and secondary!